Toys crafted by ToyMakers at East Lake UMC, Palm Harbor, brighten the lives of children facing crisis. Photos from ToyMakers of East Lake. PALM HARBOR -- Bringing joy to a child's life is a gift that ToyMakers of East Lake delivers every day of the year. There might be a few more bright wooden toys crafted and painted by the ToyMakers' workshop around Christmas, but the holiday spirit isn't confined to a season. Toys go out year-round to nonprofits, hospitals and social service agencies in Hillsborough, Pasco, Pinellas and Alachua counties for distribution to children who are sick or in crisis. "We're trying to love and take care of children," says Bob Helms, president of ToyMakers of East Lake, the nonprofit outreach mission of East Lake UMC, Palm Harbor. The gifts come back to volunteers in the smiles of children who receive something special and unexpected. It might be a green tractor, a yellow duck on wheels, a Batmobile, a pink Cadillac or a multicolored circus train. Helms remembers a particular young boy. "He was going down the hall (at the hospital) in his wheelchair, saying, 'Thank you, thank you.' You (volunteers) have a tremendous sense of feeling and accomplishment." 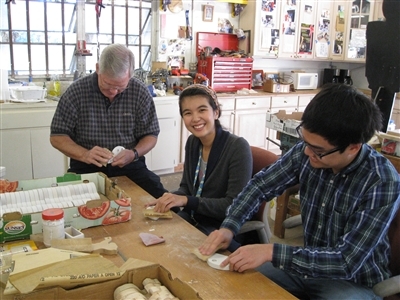 Volunteers at ToyMakers of East Lake hand-sand wood pieces that will be painted and assembled into children's toys. ToyMakers of East Lake is an all-volunteer enterprise founded about seven years ago on property purchased by East Lake UMC. The church mission is an offshoot of The ToyMakers, a nonprofit workshop in Pasco County where East Lake’s founding members learned the nuts and bolts of running what is essentially a small toy factory. Helms thought he would volunteer only one day at ToyMakers of East Lake. "Before you know it, I was coming back every day, every Saturday. It's addictive." The Pasco workshop began in 1982, when Jim McCullagh, with help from childhood friend Bruce Pahl, made a wooden toy for his ailing grandson. Later McCullagh, Pahl and their wives began making wooden toys for other children and founded The ToyMakers. Over the years, at least a dozen more workshops have sprung up in other states, including Illinois, Oklahoma and North Carolina. "We help each other’s endeavors, but we operate completely separately," Helms says. Commitment and sufficient start-up capital are all that's needed. "You don't have to start big," Helms says. "Six people and tools, and you're in." 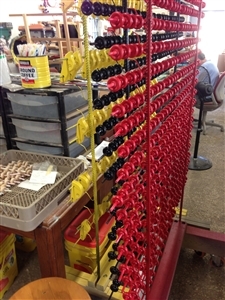 Hundreds of miniature wheels must be painted and dried to fashion toy cars, ambulances, fire trucks and even the Batmobile out of wood at Toymakers of East Lake. A volunteer works the spindle sander to create a smooth, curved edge in the workshop of ToyMakers of East Lake. The nonprofit is powered by about 190 volunteers. The East Lake organization makes toys four days a week with almost 190 volunteers, ages13 to 95. On most days, a dozen or more show up. Sometimes groups of teenagers or teams from area businesses swell the numbers to 40 or more. Click here to see a UMTV video about the volunteers. "I really like being here," says 17-year-old Sara Scharf, who started with spray painting three years ago. "I want to be an engineer. It's been a great experience. I've learned a lot. It's hands-on and you get to help people. Why wouldn't you want to come here?" Gene Watson, 76, a founding member of the East Lake workshop and a retired minister, started with the Pasco outfit after a chance conversation over a cup of coffee. Volunteers come from all walks of life, he says. There are ministers, retirees, doctors, engineers, business owners and teenagers working toward college scholarships. "It is such a variety," Watson says. "I think it's a sense that you are doing something for somebody who needs a smile, needs a good day." Workshop coffee breaks end with prayer. "It's an opportunity to reach out," says Watson. "It's an opportunity to work between denominations." Though some might consider wooden toys old-fashioned, Helms says people respond to their simplicity and connection to the natural environment. "Wood is an organic material. It has a particular appeal to everyone." One young boy who had open heart surgery carried his toy around for three years. Later, his mother began wrapping the toy every year as a Christmas gift in memory of her son surviving the life-saving surgery. Toy ideas come from anyone. 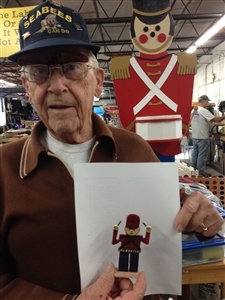 Thad Pollard, a World War II veteran who volunteers at ToyMakers of East Lake, displays a tiny wooden figure crafted at the nonprofit. Helms' grandson pointed out that there were no sea turtles or sharks on the toy list. So he and Helms made prototypes at home and brought the designs to the workshop. Scharf and another volunteer thought there weren't enough toys for older children. So they created a Tower of Hanoi brain-teaser puzzle. ToyMakers of East Lake receives cash and in-kind donations from paint sellers, lumber companies, home improvement stores or anywhere scrap wood can be found. Even for special orders, Helms says, the wood often is donated. On a trip to Beard Hardwoods in North Carolina, Helms found wood orders were sold out for the next 18 months and he couldn’t buy anything. When he explained why he needed the wood, the owner gave him a full load. The workshop produced 10,000 toys this year. It takes 25 steps to make a toy. 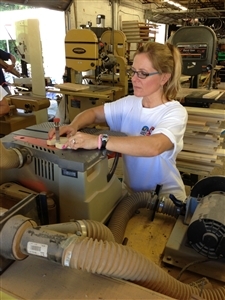 Volunteers size and shape wood pieces, draw designs, cut patterns with a band saw, sand, paint and decorate. Each toy takes about an hour to complete. "If they (volunteers) want to do something they don't know how to do, we teach them," Helms says. Toys go to nearly two dozen locations, including All Children's Hospital in St. Petersburg, Tampa General Hospital, Metropolitan Ministries in Pasco, and local Guardian ad Litem programs and Ronald McDonald houses. Toys also went to Louisiana and Mississippi after hurricanes and to Haiti after the 2010 earthquake. Sheriff's departments and shelters also get toys for children removed from homes because of abuse or domestic violence. "(Otherwise) kids are walking away from their homes with nothing," Helms says. A toy may brighten the day for a child undergoing hours of dialysis or a toddler in physical rehabilitation. "You tell a 3-year-old he has to exercise because he got hurt, he looks at you like you're from Mars," Helms says. "Show him a (wooden push toy), he'll go all over the place." 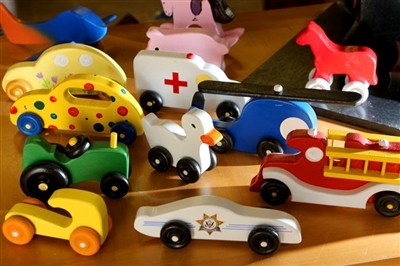 The East Lake Toymakers are planning to expand the workshop. Helms is confident the needed donations will come in. "Somehow God comes and takes care of it." Click here for information about ToyMakers of East Lake.